Thanks to John Escobar who provided this recent photo of the portrait of Laura! At first a painting was made by the wife of the initial director Mamoulian. After a month of filming he was fired, and Otto Preminger took over. He found the painting unflattering, he said it lacked the mysterious feel that the painting needed to capture the audience. It was flat and boring. Since it plays a large role in the movie, he wanted it to be perfect, it had to have allure and power. To replace it, Preminger sent Gene to studio photographer Frank Polony. Several portrait shots were taken, and the best shot was enlarged to the size of a painting. After it was framed it was lightly airbrushed with paint, giving it the appearance of brush strokes. 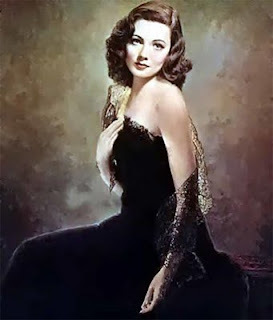 This painting of Gene Tierney as Laura was later also used in On the Riviera (1951) in color co-starring Danny Kaye, and in Woman's World (1954) starring Clifton Webb. In Woman's World the painting hung on a wall with portraits of several other women who were supposed to have been former romantic interests of Webb's character. Now there's a hat! I love this movie, great back story on the gorgeous "painting." I'll have to check out those other films where it appears. I love this film so much! I found you after you had left a comment on my blog (regarding music - how do you like Emmy the Great? ), and see that you have excellent taste as well. Always nice to meet someone with similar passions! I'd love to know where that painting is today. Anyone know? 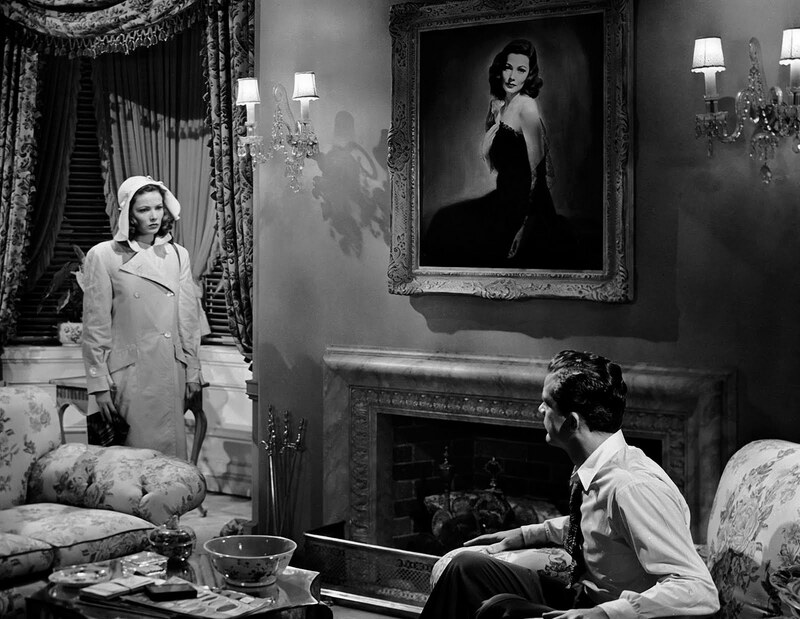 I vaguely remember haven read something about the present whereabouts of the painting of Laura. The last couple of days I've searched the web but unfortunately I cannot find it. If I discover the location I will make a post about it (I hope the paining isn't destroyed). About 20 years ago, a Hollywood actor friend who I knew in Burbank said he knew a private collector who had the painting hanging in his living room. Alas, despite my requests to see it, it never happened. I also read somewhere else that a private collector here in southern California had the painting. Where it is now is anyone's guess. So close! At least it still exists. It will turn up someday, thank you for your story! Are there prints of the painting available for sale anywhere? 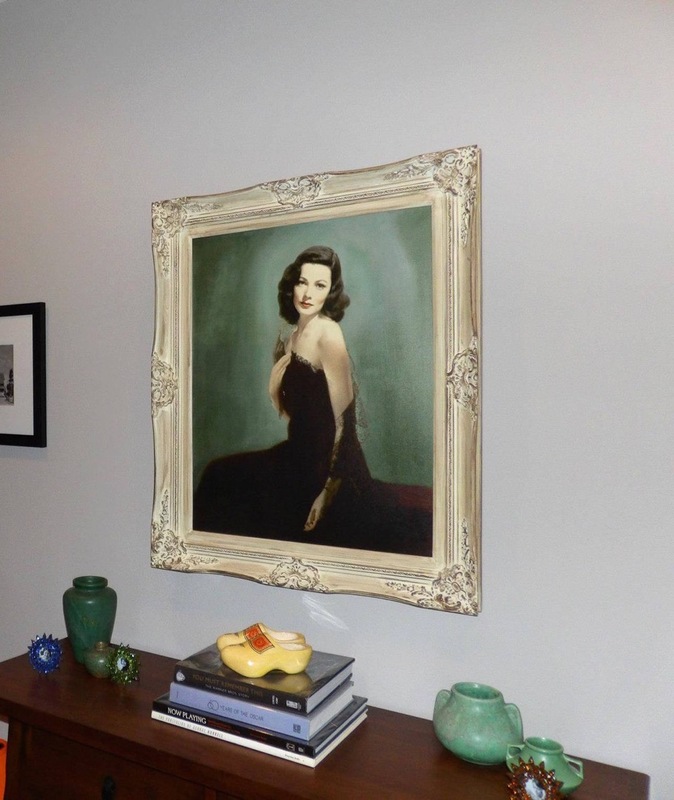 i have also been searching for a print of the Laura portrait for my spouse. any news? It's strange but it doesn't seem to exist. It's owned by a collector named Michael Shaw. He also owned the pair of ruby slippers that were stolen from the Judy Garland Museum in Grand Rapids MN in 2005. He also has the clock from "Laura" or at least he did in the story I read some time ago. Any more news on the Laura picture anyone? Markyart's info was pretty interesting though. I have information on the Laura painting and photos. I don't know how to post or I would. Who owns it? What can you tell us? Is there a website you can refer us to? I'm watching the movie now on Netflix and would love nore info! I can't figure how to post a photo. I'll try again. Also, try this Facebook link. Very nice photos and I like the are they called Dutch shoes? In the first photo. I purchased the wooden shoes in Amsterdam several years ago. A lovely tribute and interesting post, I'm still a fan of these old movies and the stars that played in them. The portrait in Woman’s World is not the Laura portrait. It is a similar pose but looking closely here are many differences. The arm position, dress and hair are not the same.